New. This handsome boxed set provides hours of enlightening entertainment for those curious about the natural world, farm life, and food. 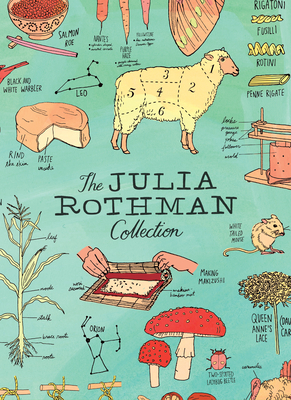 Best-selling author and illustrator Julia Rothman presents Farm Anatomy, Nature Anatomy, and Food Anatomy in a specially designed slipcase with 10 frameable prints. Num Pages: 672 pages, full colour illustrations. BIC Classification: 1KBBEY; 3JJ; 3JM; AFF; AGB; WNC. Category: (G) General (US: Trade). Dimension: 242 x 177 x 73. Weight in Grams: 2200. 2016. Paperback.....We ship daily from our Bookshop. New. Trade paperback (US). Glued binding. 672 p.
New. 1612128521 Multiple available! Brand new. ISBN|1612128521 The Julia Rothman Collection (C. )2016 New Inventory.